The third phase of my project was to restore an estuary along the 54th Avenue Channel in St. Petersburg. This involved removing marine trash and planting over 500 mangroves and 100 grass plants. The project required removal of some non-native, invasive species, but primarily addressed a barren, unproductive 175 feet of an important Tampa Bay estuary waterline. 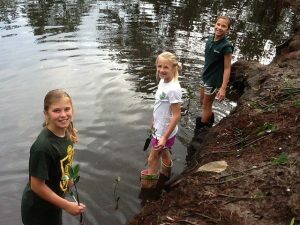 With a contribution of plants and expertise, the project relied upon support from several local organizations, including The Florida Aquarium and Tampa Bay Watch. Both of which are nonprofit organizations dedicated in part to restoring and preserving Florida estuaries. The Sustany® Foundation again provided volunteer experience and muscle! Over 410 volunteer hours were invested for this phase of the project. Sea grasses and mangroves contribute to a food chain that draws nutrients from the bay floor. As sea grasses and mangrove leaves decay, they provide food for small creatures that are eaten by fish and large animals. Withstanding currents and storms, mangrove roots now anchor the channel-side, providing better support to an otherwise unstable bank. By planting new mangroves and native grasses, this project phase will provide food and cover for small fish and animals for years to come. 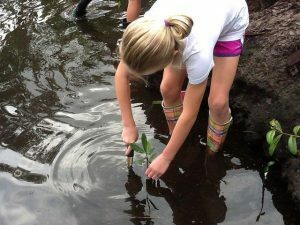 The Sustany®-supported project also advanced Shorecrest Preparatory School’s educational mission which includes enhancement of its “students’ concern for others and awareness of their responsibility to act as conscientious citizens, stewards of the environment….” The project provided an opportunity for outside hands-on learning, and it even helped attract a well-known French expert on mangroves to the school. During his visit, he inspected the project area and spoke to students and local scientists about the environmental importance of mangroves and such planting projects.